He’s back! After a couple of months gallivanting to Germany, Massachusetts and elsewhere, plus doing poetry things, the inimitable Bob Moyer is back reviewing books for Briar Patch Books. LITTLE FIRES EVERYWHERE. By Celeste Ng. Penguin Press. 338 pages. $27. With a sleight of handwriting, she conjures a Shaker Heights, Ohio, of 1997 that may or may not look like the town of the same name where she grew up. It’s a moot point, because her suburb reeks with reality —the facades, the posturing, the biases and underlying tensions that anyone who has lived in such a community can attest to, and people visiting for the first time can learn from. With no little sympathy at the same time, she takes on territory that John Updike staked out years ago, and matches him word for word. Ng pulls two people out of a Volkswagen Rabbit and drops them into this nirvana, where “… purchase … includes protection forever against depreciation and unwelcome change.” Their entrance introduces just that — unwelcome change. Artist Mia Warren and her daughter, Pearl, move into this idyllic bubble and rent a house from the Richardsons. Mia makes photo art pieces that sometimes sell, sometimes don’t, through an agent in New York. She has a noted disregard for the status quo. Pearl is literally taken in by the Richardson children. A master of misdirection, Ng keeps our focus on one of those children, Izzy, for the first part of the book. 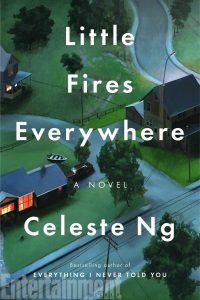 As part of her literary prestidigitation, the author also starts the story at the end — the Richardson’s house is on fire, Mia and Pearl have already puttered out of town, and Izzy set Little Fires Everywhere before she, too, took off. As she works her way back to the beginning, the author identifies issues that will upset the well-ordered community — the weight of secrets, racism, abortion and unrequited ambition. When a custody battle breaks out over a Chinese-American baby, Mia sides with the mother against the community, and Mrs. Richardson makes a choice that will have unexpected results: She uncovers Mia’s mysterious past. That poignant backstory takes us into deep questions of identity and art, which play out in small but devastating bursts throughout the final pages of the book. 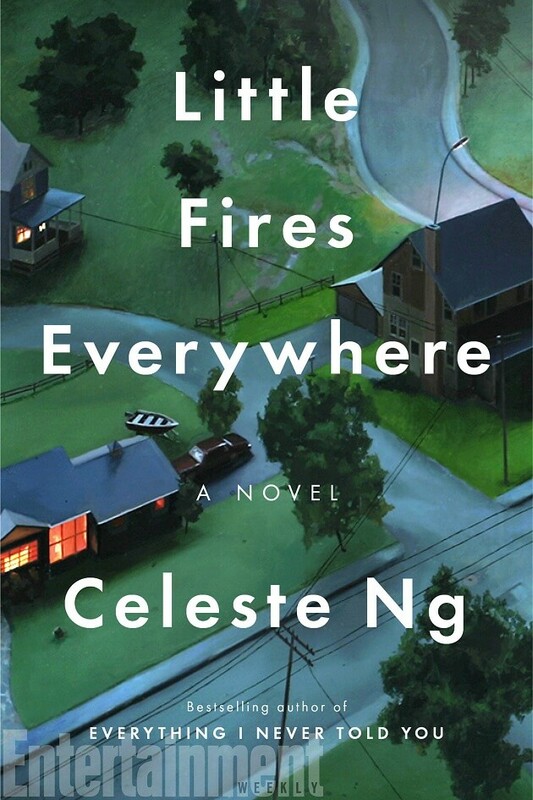 As it turns out, it’s Mia’s presence and the pieces she puts together that set off Little Fires Everywhere, fires that do much more damage than the ones Izzy set. This book is one for our age, if not the ages. Abracadabra! This entry was posted in Contemporary literary fiction, Mysteries and tagged Celeste Ng. Bookmark the permalink.